Traditional Uses: Uplifting and invigorating. Finally, an aromatherapy set you've always wanted to have. 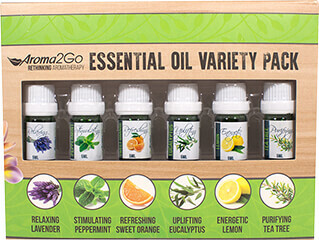 Aroma2go takes your favorite essential oils and combined these scents in a pack that you will enjoy. This pack contains Lavender, Peppermint, Sweet Orange, Eucalyptus, Lemon, and Tea Tree. Lavender and its soft floral scent evokes a sense of tranquility. It is a classic scent associated with calming. Our Lavender essential oil originates from the luscious Lavender fields in France. For massage, dilute 5 drops of essential oil in 10 mL of a base oil. Or add it to your bath or diffuser. Few scents are as cooling as Peppermint. 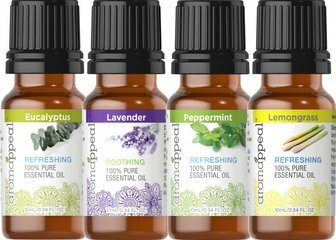 Peppermint oil is invigorating—especially when rubbed on the temples—and is a refreshing and stimulating to the senses. For massage, dilute 5 drops of essential oil in 10 mL of a base oil. Or add it to your bath or diffuser. Eucalyptus has a powerful woody and slightly sweet scent that is soothing and rejuvenating. Our Eucalyptus oil is steam distilled, assuring you of the purest aromatherapy experience. For massage, dilute 5 drops of essential oil in 10 mL of a base oil. Or add it to your bath or diffuser. With its soft, citrus undertones, Lemongrass oil will leave you feeling cleansed and serene. This purifying scent is at once relaxing and rejuvenating. For massage, dilute 5 drops of essential oil in 10 mL of a base oil. Or add it to your bath or diffuser. The pure essences of flowers have been linked with love through the ages. A spicy-sweet blend of mandarin orange, lemon, cardamom, sandalwood and other fragrant essential oils perfect for setting the mood. Traditional Uses: Cleansing and purifying. Caution: For external use only. Do not use directly on skin, dilute in a carrier oil. Do not apply to broken or irritated skin. If skin sensitivity occurs, discontinue use. If you are pregnant, nursing, or taking any medications, consult your doctor before use. Discontinue use and consult your doctor if any adverse reactions occur. Keep out of reach of children. Keep oils away from eyes. Flammable.